Chlorine gas is a pulmonary irritant with intermediate water solubility that causes acute damage in the upper and lower respiratory tract. Occupational exposures constitute the highest risk for serious toxicity from high-concentration chlorine (see the image below). Mixing of chlorine bleach (sodium hypochlorite) with ammonia or acidic cleaning agents is a common source of household exposure. As with all poisons, the dose determines the toxicity. Exposure to low concentrations of chlorine for prolonged periods may have destructive effects, as might very short-term exposure to high concentrations. 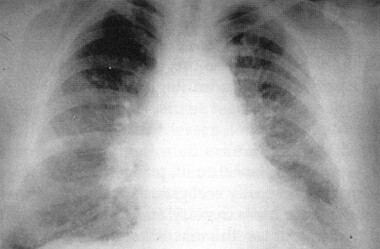 Chest radiograph of a 36-year-old chemical worker 2 hours postexposure to chlorine inhalant. She had severe resting dyspnea during the second hour, diffuse crackles/rhonchi on auscultation, and a partial pressure of oxygen of 32 mm Hg breathing room air. The radiograph shows diffuse pulmonary edema without significant cardiomegaly. Used with permission from Medical Aspects of Chemical and Biological Warfare, Textbook of Military Medicine. 1997: 256. Symptoms may vary depending on the degree of exposure. Exposure possibilities include acute low levels, acute high levels, and chronic low levels. Abnormalities include hypoxia (from bronchospasm or pulmonary edema)  and metabolic acidosis. The metabolic acidosis may be hyperchloremic (nonanion gap). Chest radiograph findings are frequently normal initially but later may show nonspecific abnormalities, pulmonary edema, pneumonitis, mediastinal free air, myocardial depression,  or signs of ARDS. Chlorine gas is a pulmonary irritant with intermediate water solubility that causes acute damage in the upper and lower respiratory tract. Chlorine gas was used as a chemical weapon in World War I. Currently, occupational exposures constitute the highest risk for serious toxicity from high-concentration chlorine. Mixing of chlorine bleach (sodium hypochlorite) with ammonia or acidic cleaning agents is a common source of household exposure. See Etiology. The respiratory and mucous membrane irritant effects of chlorine have been well known for many years. John Doughty, a New York City schoolteacher, first suggested use of chlorine gas as a chemical warfare agent during the American Civil War. This proposal was never acted upon during that war. Chlorine gas was officially introduced into the chemical warfare arsenal in 1915 at Ypres, Belgium. Accounts of chlorine attacks at Ypres describe an olive-green cloud rolling over the Allied positions, following the ground contours, and sinking into the trenches. Soldiers seeking safety in those trenches were overcome by the gas and experienced tearing eyes, vomiting, and difficulty breathing. They abandoned their trenches and suffered great losses from artillery and rifle fire. An estimated 93,800 tons of chlorine gas was produced during World War I, with more than half produced by Germany. Total gas casualties in World War I were estimated at almost 1.3 million troops. Of the 70,552 American soldiers poisoned with various gases in World War I, 1843 were exposed to chlorine gas. Chlorine was abandoned as a warfare agent when the use of gas masks was introduced and more effective compounds were created and deployed. Chlorine liquid is presently used in cleaning agents (eg, bleach, disinfectants), in water purification, and in the manufacture of items such as plastics. It is used in the following industries: pesticide, refrigerant, paper and pulp, textile, metallurgy, pharmaceutical, cosmetic, battery, water and sewage purification, and food processing. More than 200 significant industrial accidents involving chlorine have occurred since World War I. The most important aspect of treating patients exposed to chlorine gas is the provision of good supportive care. Provide supplemental oxygen as necessary. Positive pressure ventilation with positive end-expiratory pressure may improve oxygenation in patients with noncardiogenic pulmonary edema. Bronchospasm may require treatment with beta-agonists or other bronchodilators. Other medications that may be used include nebulized sodium bicarbonate and inhaled or systemic corticosteroids. See Treatment. Educate patients on the risks associated with the improper handling of chlorine pool chemicals and the improper mixing of household cleaning chemicals. For patient education resources, see Chemical Warfare, Personal Protective Equipment, and Bronchoscopy. Chlorine is a greenish-yellow, noncombustible gas at room temperature and atmospheric pressure. Prolonged exposure to chlorine gas may occur because its moderate water solubility delays onset of upper airway symptoms for several minutes. In addition, chlorine gas is heavier than air in its pure form, causing it to remain near ground level and increasing exposure time. The immediate effects of chlorine gas toxicity include acute inflammation of the conjunctivae, nose, pharynx, larynx, trachea, and bronchi. Irritation of the airway mucosa leads to local edema secondary to active arterial and capillary hyperemia. Plasma exudation into the alveoli results in pulmonary congestion and edema. The hallmark of pulmonary injury associated with chlorine toxicity is pulmonary edema, manifested clinically as dyspnea, adventitious lung sounds, and hypoxia. Noncardiogenic pulmonary edema is thought to occur when there is a loss of pulmonary capillary integrity, and subsequent transudation of fluid into the alveolus. The onset can occur within minutes or hours, depending upon severity of exposure. Persistent hypoxemia is associated with a higher mortality rate. In animal models of chlorine gas toxicity, immediate respiratory arrest occurs at 2000 ppm, with the lethal concentration for 50% of exposed animals in the range of 800-1000 ppm. Bronchial constriction occurs in the 200-ppm range, with evidence of effects on ciliary activity at exposure levels as low as 18 ppm. With acute exposures of 50 ppm and subacute inhalation as low as 9 ppm, chemical pneumonitis and bronchiolitis obliterans have been noted. Mild focal irritation of the nose and trachea without lower respiratory effects occur at 2 ppm. The eye is rarely damaged severely by chlorine gas toxicity; however, burns and corneal abrasions have occurred. Acids formed by the chlorine gas reaction with the conjunctival mucous membranes are partially buffered by the tear film and the proteins present in tears. Consequently, acid burns to the eye are typically limited to the epithelial and basement membrane, rarely extending to the deep endothelial cells. Acid burns to the periphery of the cornea and conjunctiva often heal uneventfully. Burns to the center of the cornea may lead to corneal ulcer formation and subsequent scarring. Occupational exposures constitute the highest risk for serious exposure to high-concentration chlorine. Other exposures occur during industrial or transportation accidents. Wartime exposure is rare but possible. Household exposure occurs with chlorination tablet accidents during swimming pool maintenance, [17, 18, 19] or with inappropriate mixing of sodium hypochlorite (bleach) cleaning agents with ammonia products, which produces chloramine gas. Typically, this occurs in an enclosed environment such as a restroom. Chlorine gas also may be released in the household by mixing sodium hypochlorite with acidic cleaning agents (toilet bowl cleaners). Internationally, chlorine gas accounts for the largest single cause of major toxic release incidents. Chlorine is used in chemical, paper, and textile industries, along with sewage treatment. In each of these industries, the potential exists for accidental release. Most individuals exposed to chlorine gas recover without significant sequelae. Even exposure to high-concentration chlorine gas is unlikely to result in significant, prolonged pulmonary disease. Morbidity from moderate and severe exposures is typically caused by noncardiogenic pulmonary edema. This may occur within 2-4 hours of exposure to moderate chlorine concentrations (25-50 ppm) and within 30-60 minutes of severe exposures (>50 ppm). In serious exposures, sloughing of the pulmonary mucosa occurs in 3-5 days, and oozing areas become covered with mucopurulent exudate. This chemical pneumonitis is often complicated by secondary bacterial invasion. Although no definite conclusion can be drawn concerning the long-term effects of an acute chlorine gas exposure, findings suggest increased risk of persistent nonspecific airway responsiveness. Furthermore, following an acute exposure, some patients with injured pulmonary epithelium have progressed to develop pulmonary fibrosis. Bronchiolitis obliterans and emphysema have also been described in patients following acute exposures. Hedges JR, Morrissey WL. Acute chlorine gas exposure. JACEP. 1979 Feb. 8(2):59-63. [Medline]. Zaky A, Bradley WE, Lazrak A, Zafar I, Doran S, Ahmad A, et al. Chlorine inhalation-induced myocardial depression and failure. Physiol Rep. 2015 Jun. 3 (6):[Medline]. Gilchrist HL, Matz PB. The residual effects of warfare gases: the use of chlorine gas, with report of cases. Med Bull Vet Adminis. 1933. 9:229-270. Agency for Toxic Substances and Disease Registry. Medical Management Guidelines for Chlorine. Available at http://www.atsdr.cdc.gov/MMG/MMG.asp?id=198&tid=36. Accessed: July 30, 2013. Nelson GD. Chloramines and Bronamines. Kirk RE, Othmer DF, eds. Concise Encyclopedia of Chemical Technology. New York: John Wiley and Sons; 1985. 256. Centers for Disease Control and Prevention. Ocular and respiratory illness associated with an indoor swimming pool--Nebraska, 2006. MMWR Morb Mortal Wkly Rep. 2007 Sep 14. 56(36):929-32. [Medline]. Schwartz DA. Acute inhalational injury. Occup Med. 1987 Apr-Jun. 2(2):297-318. [Medline]. Jones RN, Hughes JM, Glindmeyer H, Weill H. Lung function after acute chlorine exposure. Am Rev Respir Dis. 1986 Dec. 134(6):1190-5. [Medline]. Hayaishi O. Enzymatic hydroxylation. Am Rev Biochem. 1969. 38:21-44. Barrow CS, Alarie Y, Warrick JC, Stock MF. Comparison of the sensory irritation response in mice to chlorine and hydrogen chloride. Arch Environ Health. 1977 Mar-Apr. 32(2):68-76. [Medline]. Henderson Y, Haggard HW. Noxious Gases and the Principles of Respiration Influencing Their Action. 2nd ed. New York: Rienhold Publishing Corp; 1943. 171-3. Das R, Blanc PD. Chlorine gas exposure and the lung: a review. Toxicol Ind Health. 1993 May-Jun. 9(3):439-55. [Medline]. Adelson L, Kaufman J. Fatal chlorine poisoning: report of two cases with clinicopathologic correlation. Am J Clin Pathol. 1971 Oct. 56(4):430-42. [Medline]. Rotman HH, Fliegelman MJ, Moore T, Smith RG, Anglen DM, Kowalski CJ, et al. Effects of low concentrations of chlorine on pulmonary function in humans. J Appl Physiol. 1983 Apr. 54(4):1120-4. [Medline]. D'Alessandro A, Kuschner W, Wong H, Boushey HA, Blanc PD. Exaggerated responses to chlorine inhalation among persons with nonspecific airway hyperreactivity. Chest. 1996 Feb. 109(2):331-7. [Medline]. Shusterman D, Murphy MA, Balmes J. Influence of age, gender, and allergy status on nasal reactivity to inhaled chlorine. Inhal Toxicol. 2003 Oct. 15(12):1179-89. [Medline]. Babu RV, Cardenas V, Sharma G. Acute respiratory distress syndrome from chlorine inhalation during a swimming pool accident: a case report and review of the literature. J Intensive Care Med. 2008 Jul-Aug. 23(4):275-80. [Medline]. Martinez TT, Long C. Explosion risk from swimming pool chlorinators and review of chlorine toxicity. J Toxicol Clin Toxicol. 1995. 33(4):349-54. [Medline]. Wood BR, Colombo JL, Benson BE. Chlorine inhalation toxicity from vapors generated by swimming pool chlorinator tablets. Pediatrics. 1987 Mar. 79(3):427-30. [Medline]. Davis DS, Dewolf GB, Ferland KA, et al. Accidental Release of Air Toxins. Park Ridge, New Jersey: NDC; 1989. 6-9. Van Sickle D, Wenck MA, Belflower A, Drociuk D, Ferdinands J, Holguin F, et al. Acute health effects after exposure to chlorine gas released after a train derailment. Am J Emerg Med. 2009 Jan. 27(1):1-7. [Medline]. Jones R, Wills B, Kang C. Chlorine gas: an evolving hazardous material threat and unconventional weapon. West J Emerg Med. 2010 May. 11(2):151-6. [Medline]. [Full Text]. Department of Homeland Security/Federal Bureau of Investigation. April 23, 2008. Potential Terrorist Attack Methods. Available at http://www.gwu.edu/~nsarchiv/nukevault/ebb388/docs/EBB015.pdf. Accessed: July 30, 2013. Kowitz TA, Reba RC, Parker RT, Spicer WS Jr. Effects of chlorine gas upon respiratory function. Arch Environ Health. 1967 Apr. 14(4):545-58. [Medline]. Weill H, George R, Schwarz M, Ziskind M. Late evaluation of pulmonary function after acute exposure to chlorine gas. Am Rev Respir Dis. 1969 Mar. 99(3):374-9. [Medline]. Kaufman J, Burkons D. Clinical, roentgenologic, and physiologic effects of acute chlorine exposure. Arch Environ Health. 1971 Jul. 23(1):29-34. [Medline]. JONES AT. Noxious gases and fumes. Proc R Soc Med. 1952 Sep. 45(9):609-10. [Medline]. Lawson JJ. Chlorine exposure: a challenge to the physician. Am Fam Physician. 1981 Jan. 23(1):135-8. [Medline]. Shroff CP, Khade MV, Srinivasan M. Respiratory cytopathology in chlorine gas toxicity: a study in 28 subjects. Diagn Cytopathol. 1988 Mar. 4(1):28-32. [Medline]. Malo JL, Cartier A, Boulet LP, L'Archeveque J, Saint-Denis F, Bherer L, et al. Bronchial hyperresponsiveness can improve while spirometry plateaus two to three years after repeated exposure to chlorine causing respiratory symptoms. Am J Respir Crit Care Med. 1994 Oct. 150(4):1142-5. [Medline]. Francis HC, Prys-Picard CO, Fishwick D, Stenton C, Burge PS, Bradshaw LM, et al. Defining and investigating occupational asthma: a consensus approach. Occup Environ Med. 2007 Jun. 64(6):361-5. [Medline]. [Full Text]. Brooks SM, Weiss MA, Bernstein IL. Reactive airways dysfunction syndrome (RADS). Persistent asthma syndrome after high level irritant exposures. Chest. 1985 Sep. 88(3):376-84. [Medline]. Ginsberg JP, Holbrook JR, Chanda D, Bao H, Svendsen ER. Posttraumatic stress and tendency to panic in the aftermath of the chlorine gas disaster in Graniteville, South Carolina. Soc Psychiatry Psychiatr Epidemiol. 2012 Sep. 47(9):1441-8. [Medline]. [Full Text]. Szerlip HM, Singer I. Hyperchloremic metabolic acidosis after chlorine inhalation. Am J Med. 1984 Sep. 77(3):581-2. [Medline]. Department of Labor: Occupational Safety and Health Administration (OSHA). General description and discussion of the levels of protection and protective gear (1910.120, App B). Available at http://www.osha.gov/pls/oshaweb/owadisp.show_document?p_table=STANDARDS&p_id=9767. Accessed: July 30, 2013. Baxter PJ, Davies PC, Murray V. Medical planning for toxic releases into the community: the example of chlorine gas. Br J Ind Med. 1989 Apr. 46(4):277-85. [Medline]. [Full Text]. O'Malley GF, Fasano C, Dominici P, Aguilera E. Eye irrigation is more comfortable with a lidocaine: containing irrigation solution compared with normal saline. J Trauma. 2008 May. 64(5):1360-2. [Medline]. Done AK. The toxic emergency, it's a gas. Emerg Med. 1976. 305-14. Vinsel PJ. Treatment of acute chlorine gas inhalation with nebulized sodium bicarbonate. J Emerg Med. 1990 May-Jun. 8(3):327-9. [Medline]. Cevik Y, Onay M, Akmaz I, Sezigen S. Mass casualties from acute inhalation of chlorine gas. South Med J. 2009 Dec. 102(12):1209-13. [Medline]. Nelson LS. Simple asphyxiants and pulmonary irritants. Goldfrank LR, ed. Goldfrank's Toxicologic Emergencies. 6th ed. Stanford, Conn: Appleton & Lange; 1998. 1523-38. Aslan S, Kandis H, Akgun M, Cakir Z, Inandi T, Görgüner M. The effect of nebulized NaHCO3 treatment on "RADS" due to chlorine gas inhalation. Inhal Toxicol. 2006 Oct. 18(11):895-900. [Medline]. Kramer CG. Chlorine. J Occup Med. 1967 Apr. 9(4):193-6. [Medline]. Chester EH, Kaimal J, Payne CB Jr, Kohn PM. Pulmonary injury following exposure to chlorine gas. Possible beneficial effects of steroid treatment. Chest. 1977 Aug. 72(2):247-50. [Medline]. Akdur O, Sozuer EM, Ikizceli I, Avsarogullari L, Ozturk F, Muhtaroglu S, et al. Experimental inhalation of chlorine gas produced with a different method; effects of N-acetyl cysteine on acute pulmonary damage. Toxicol Mech Methods. 2008 Jan. 18(9):739-43. [Medline]. Fanucchi MV, Bracher A, Doran SF, Squadrito GL, Fernandez S, Postlethwait EM, et al. Post-exposure antioxidant treatment in rats decreases airway hyperplasia and hyperreactivity due to chlorine inhalation. Am J Respir Cell Mol Biol. 2012 May. 46(5):599-606. [Medline]. [Full Text]. Department of Labor: Occupational Safety and Health Administration (OSHA). TABLE Z-1 Limits for Air Contaminants. Available at http://www.osha.gov/pls/oshaweb/owadisp.show_document?p_table=STANDARDS&p_id=9992. Accessed: July 30, 2013. Department of Labor: Occupational Safety and Health Administration (OSHA). Occupational Safety and Health Guideline for Chlorine Dioxide. Available at http://www.cdgenvironmental.com/sites/default/files/OHSA_ClO2.pdf. A section from a lung biopsy (hematoxylin and eosin stain; original magnification X 100) from a 36-year-old chemical worker taken 6 weeks postexposure to chlorine. At that time, the patient had no clinical abnormalities and a partial pressure of oxygen of 80 mm Hg breathing room air. The section shows normal lung tissues without evidence of interstitial fibrosis and/or inflammation. Used with permission from Medical Aspects of Chemical and Biological Warfare, Textbook of Military Medicine. 1997: 256.